Rescue officials have reported that five people survived the capsized boat conveying about 24 passengers in Festac. A total of 13 bodies most of whom were hurrying to watch Tuesday night’s European Champions League football games, lost their lives in the accident which occurred at about 7.45 p.m have been recovered even though conflicting reports states that 14 bodies were recovered. 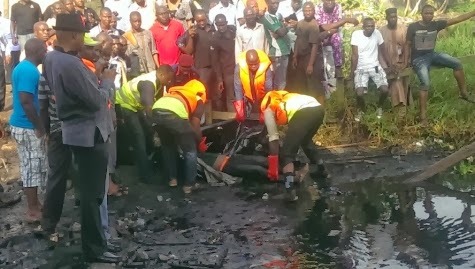 Six bodies were still missing as divers frantically searched the depths of the dark, murky river till 12 noon Wednesday, while the recovered corpses had been deposited at the Lagos State University Teaching Hospital. “But fortunately, the locals assisted by recovering about 13 bodies. 11 males and two females, including a girl of less than 10 years,” Mr. Farinloye added. Residents say that the boat, which ferries people from 4th Avenue to the nearby 6th Avenue, a distance of less than 50 yards across the water, has a capacity for 17 passengers. But on the ill-fated trip, at least 24 people crowded themselves on the boat as some of the young men hurried to the football viewing centre at 41 Road, 4th Avenue. “They refused to come down. One small girl was shouting that if the boat turns, she would swim out,” said David Mark, a resident who said he was waiting on the queue when the mishap occurred. “When the boat got to the middle, it began to shake and the people were shouting, before you know it, the boat turned down. That small girl survived,” Mr. Mark added. Families and relatives of victims wore long faces as they waited for news of the yet to be recovered bodies. Osaro Okunbor, who lost his 26 year old younger brother, Uyi, said that they were told to see the local government officials before the corpse would be released to them. “He (Uyi) left home at about 5 o’clock yesterday. I had a call at about 11 o’clock that my brother is somewhere. I got there and saw the corpse on the ground,” Mr. Okunbor said. “I’m not myself. Even my family, my mother, my father they are all worried. This kind of thing has never happened to me before,” he added. Furious residents vented their frustration at government officials present for their failure to construct a pedestrian bridge, “even a wooden one,” for them. PREMIUM TIMES checks showed that while commercial motorcyclists charge N150 from 4th Avenue to 6th Avenue, crossing via a boat, which is a much shorter route, costs N10. “It was the church people that built the old bridge but it spoilt since three years ago. Some people wanted to build another one but government refused, saying it’s their job,” said Mr. Mark. Several residents corroborated Mr. Mark’s claims that the local government authorities stopped interested people from constructing a new pedestrian bridge along the water way. Efforts to get the reaction of the Amuwo Odofin local government authorities were unsuccessful as officials present said that only the council chairman, Ayodele Adewale, could respond to the claims. Mr. Adewale was not immediately available for comments. But a witness said he, along with officials of the Lagos State Emergency Management Agency, visited the scene on Tuesday night where he removed his cap and wept. “I count almost 11 boys and one girl, dem dead. Even one of my brother, Chukwuebuka, follow them. E dey mortuary now. He is 25. E say e wan go watch match for 401 (Road),” said Anthony Okakwu, who accompanied the corpses to the mortuary early Wednesday morning. Mr. Farinloye said that the actual number of people in the boat could not be ascertained but the divers would continue their search. One of the divers said that chances of recovering another body would increase when the sun goes down. Periodically, a boat containing half a dozen bare-chested divers would pull into the river and the men would leap into the dark water and disappear for a few minutes before resurfacing. And a diver standing ashore would gargle a shot of dry gin and spray it into the air, infuriating the government officials and journalists present. One of them said it’s a ritual so that the water “doesn’t take another person,” in this case, one of the divers. “It’s a normal routine. The water dey vex,” he added.